One thing that I can think we can all improve upon in our lives is developing a spirit of thankfulness. 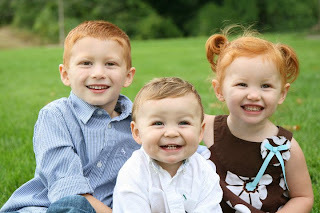 Thankfulness is something that my husband and I want to teach our children, in part so they don't grow up with a sense of entitlement, but also because we believe that teaching our children to give thanks helps them give praise to God and it helps them to be good stewards of what they have been given. The Bible has clearly placed an emphasis on believers who gave thanks and how we should model that humility in our own lives. Numerous times in the book of Psalms and the epistles, we are given examples of believers who were thankful. The book of Colossians is one of my favorites and Paul's prayers, as well as admonitions to give thanks, are great models for me when struggling to express thanks. For example, in Colossians 1:12-14 he says, "Always thanking the Father, who has enabled you to share the inheritance that belongs to God's holy people, who live in the light. For He has rescued us from the one who rules in the kingdom of darkness, and He has brought us into the Kingdom of His dear Son. God has purchased our freedom with His blood and has forgiven all our sins." And again in Colossians 2:7, "Let your lives overflow with thanksgiving for all He has done." Do you see why it is so important that we model a heart of thanks to our children and those around us? Thanks whispered is the life-breath of the gospel. I know in my own life I am often tempted to look at what I don't have, rather than what I do have. But if I take the time to thank the Lord for all I have been given (temporal and eternal) I very quickly see that what I have far surpasses what I don't have. It's easy to give your child opportunities to practice giving thanks. 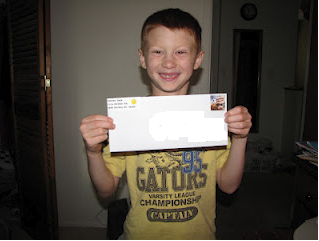 It could be as simple as a phone call to their relative thanking them for the birthday card and money. Or, it may involve actually writing out thank you notes. 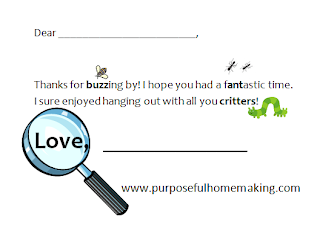 It can be overwhelming for a young child to write out a lot of thank you notes after a birthday party so you could pick up the fill in the blank kind (I've even found them at the Dollar Store) or you can make your own like I did for Carter's recent Bug Hunting party. Having your child write a thank you note is a great lesson in learning to say thanks, but it's also a great writing activity (click here if you are looking for a writing curriculum). If your child is writing a thank you letter it's nice if they can have some fun paper to use. It can be store bought or as simple as a blank piece of paper with stickers around the edges. I know our kids love putting a couple of stickers on the envelope too. It's also nice if you happen to have some kid-friendly postage stamps on hand for the finishing touch. How do you teach your children to express thanks? What about you? Do you long to develop a heart of thanks, but need help getting started in the right direction? As you may know, I began a more thorough process of giving thanks to my Father after reading One Thousand Gifts by Ann Voskamp. It has also helped to record those gifts of grace in my Gratitude Journal as well. I strongly encouraged you to read One Thousand Gifts. It will help open your eyes to the grace around you. My Job Chart-a free online job chart--love it! Great reminder! TJ and I have been striving to be more purposeful in teaching our children to have a spirit of thankfulness. It has been especially important during the moments when they are grumbling or complaining, and using those moments to teach them about God's blessings and provision. Then following up with having them turn their complaining statement to a thankful statement. Obviously, my younger one still needs help with putting this into practice. Thanks for sharing Shannon! Praying right now that God would help you as you strive to raise children that are God focused and not man focused.